The Binghamton Junior Senators showcased why they were one of the top teams in the NA3HL last season, and they show no signs of slowing down for the new season. 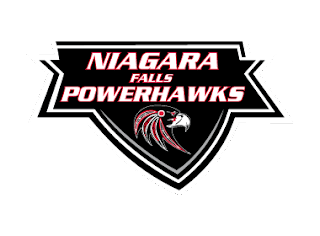 In Friday night action at the Ice House Sports Complex in BInghamton, the Junior Senators skated to a dominating 16-2 win over the visiting Niagara Falls PowerHawks. Binghamton struck early in the game, jumping out to a 2-0 lead within the first minute of the opening period. Eric Melso put the home team on the board 46 seconds into the game. Mike Padgeon assisted. Only ten seconds later, Zach Bell made it 2-0. Marcus Cook and Riley Botting were credited with the assists. Greg Simmons extended the Binghamton lead at 6:46 with Cook and Bell lending the assists. Wyatte Roberts added his own goal 58 seconds later to give the Junior Senators a four-goal lead. Alexsander Conrad and Andrew Palmiter assisted. Binghamton scored once more in the first period to carry a 5-0 lead into the intermission. Marcus Cook notched his third point of the contest with a goal at 10:49. Palmiter assisted. The Junior Senators’ attack continued into the second period with four more goals. Melso added a second goal to his total 2:44 into the frame, with Padgeon and Nico Corsaro grabbing the assists. At 8:49 of the period, a series of fights and penalties to both teams resulted in 108 minutes in penalty time. Padgeon then scored with Will Darling and Melso assisting at 12:42. Mason Fay gave Binghamton an 8-0 lead at 15:17. Darling and Rory Gresham assisted. Simmons put one in the net to close out the scoring in the second period for the Junior Senators. Padgeon and Corsaro were credited with the assists. Playing with a 9-0 lead, Binghamton wasted no time in adding to that total in the third period. Liam Murphy found the back of the net only 1:18 into play. Melso came up with the assist. Fay scored 94 seconds later for the Junior Senators with Melso tallying yet another point on the night with an assist. Niagara Falls finally got on the board when Jack Kinsman snuck one past Jeff Zero at 5:06. Owen Green and Miguel Mercado provided the assists. Eric Melso kept the machine rolling for Binghamton with his third goal of the night at 7:36. Corsaro added another assist. Melso struck again for his fourth goal at 9:07. Greg Simmons assisted as the scoreboard showed a 13-1 lead for the home team. Binghamton kept the pressure on the PowerHawks, with Corsaro adding his own tally at 10:59. Roman Boffa and Padgeon assisted on the goal. Simmons notched his own hat trick at 12:27 off assists from Melso and Bell. Darling closed out the scoring for the Junior Senators. His goal, coming at 16:13, was assisted by Caden Dearborn and made it 16-1. Niagara Falls was able to tack a second goal on the board with thirteen seconds left in the game. Owen Green was assisted by Jack Kinsman. Green and Kinsman led the PowerHawks with two points apiece. Eric Melso led the Junior Senators with four goals and four assists on the evening. The same teams will face off once again Saturday evening at the Ice House Sports Complex in Binghamton. Game time is set for 8pm.